When we inspected him at Anne’s studio, I had wondered aloud if there was some way to turn the green silk of his hakama inside out to show off the beautifully-preserved color hiding inside, but Anne shook her head. “Signs of age are part of his charm,” she insisted. Signs of age are one thing; smelly, dusty and age-rotted silk are another. While Anne mused about how to best clean the layers of clothing, I inspected the kimono for holes. Two prominent frays were visible along the decorated hem, along with one or two tiny holes in other areas. 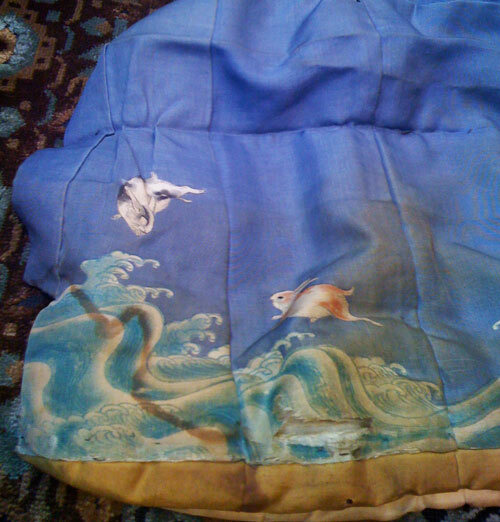 The white patch under the fray in the photo is from batting where the hem of the kimono has been padded. The most obvious damage was to the collar of the hadajuban, or base layer. 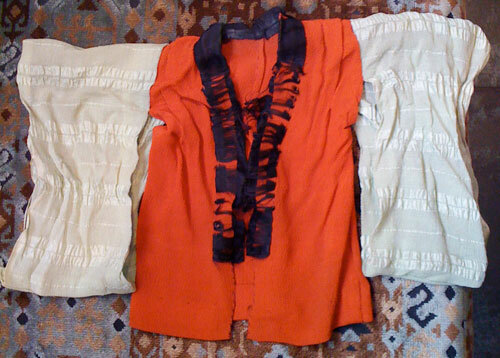 The hadajuban is of persimmon orange-red chirimen silk with sleeves of pale sage green chirimen. The collar is darkest black, likely dyed with something that has caused the silk to completely degrade over time. Considering my current stock of solid black silk, I noted that would be simple to fix. Fortunately for us, the body and sleeve silks were in much better, if still stinky, condition. The sleeves in particular caught our interest. The weave is unusual; chirimen, but with an added twist as there are stripes of smooth mixed in with the usual chirimen ripple. We fingered the fabrics and mused about the unexpected texture. I pulled out the narrow, soft heko obi that had contained his tattered postcard and showed it to Anne. “You found it in there?” Yep. And oh look, more chirimen. I had forgotten to bring the postcard, but told Anne it was in a ziplock bag and seemed to be off-gassing as the bag kept expanding no matter how many times I let the air out. “The paper shouldn’t really be touching plastic,” she counseled. We discussed options involving acid-free paper while I lamented not having actually brought the postcard with me. The next day I was on a plane heading back up north to the Bay Area, this time without my little traveling companion. His glass case sits empty upon my bookshelf, awaiting his return.